Does “Professional Grade” mean full safety coverage for every 2020 GMC Acadia? 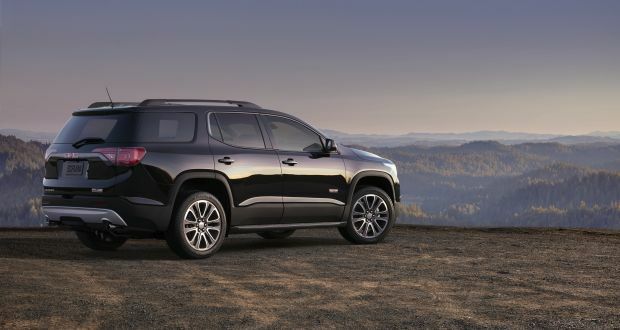 What changes will make 2020 GMC Acadia different? Revised exterior styling, the possible introduction of a turbocharged four-cylinder engine, and hopefully, expanded availability of key safety features. Considered a midcycle refresh, the changes will be the most significant since model-year 2017, when GMC relaunched the nearly full-size Acadia as a midsize crossover. The ’20 Acadia will again seat up to seven and slot into GMC’s lineup between the smaller Terrain crossover and the full-size, body-on-frame Yukon SUV. The relaunch gave the Acadia new styling, different drivetrains, and updated features while reducing its overall length by more than 7 inches and its curb weight by more than 700 pounds. Passenger room decreased only slightly but maximum cargo volume shrunk from 116 cubic feet to a below-midsize-class average 79 cubic feet. Buyers responded well to the downsizing. Acadia sales rose more than 25 percent in calendar 2017. However, demand through the first half of 2018 is off about 11 percent and Acadia ranks near the bottom of a competitive set of three-row midsize crossovers led by the Ford Explorer, Toyota Highlander, Honda Pilot, Toyota Highlander, and Chevrolet Traverse. Wait. The 2020 will have the updates that’ll see this crossover through to its next full redesign, likely for model-year 2022 or ’23. Waiting for the ‘20 gets you the most up-to-date styling, what could be a new engine and what we hope will be a more sophisticated transmission, and is an opportunity to see if GMC democratizes important driver-assistance features. On the 2019 Acadia autonomous emergency braking capabable of stopping the crossover to prevent a frontal collision was available only on the top two trim levels, called SLT-2 and Denali. Same for forward-collision warning and automatic high-beam headlight control. GMC should follow the lead of rivals like Toyota, Honda, and Nissan and such driver assists standard across the board, or at least make then optionally available on the balance of the Acadia lineup. The 2020 Acadia lineup itself should mirror the model-year-’19 roster, beginning with the entry-level SL model and ascending through SLE-1 and SLE-2, SLT-1 and SLT-2, and topping out with the flagship Denali. Off-road-oriented All Terrain versions should also return, likely based on SLE-2 and SLT-1 models. Expect front-wheel drive to again be standard on all models, with traction-aiding all-wheel drive (AWD) standard on the All Terrain and available on all but the SL. Yes. As with most midcycle updates, expect the 2020 Acadia to get evolutionary styling changes. Camouflaged prototypes seen at General Motors testing facilities indicate revisions to nose and tail. The front end will likely change the most with a new grille and lower fascia that’ll borrow cues from the recently redesigned 2019 GMC Sierra 1500 full-size pickup truck. Updates to the stern will be less dramatic with a slightly reshaped bumper and taillights. Most everything along the body sides appears as though it will carry over from the 2019 Acadia. Figure on the flagship Denali to again stand apart with its unique grille and exterior trim, standard LED lighting, and standard 20-inch alloy wheels. Expect the All Terrain versions to again be distinguished by a body-color grille surround, dark chrome trim, and unique 17-inch wheels with all-terrain tires. Inside, All Terrains should again have exclusive five-passenger seating and logos, and on five-passenger versions, covered storage bins and a cargo management system in the rear cargo floor in place of a third-row seat. 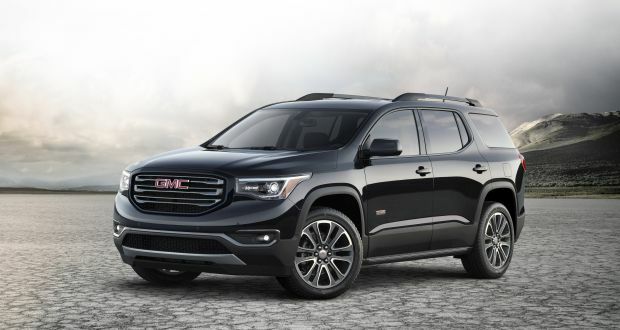 GMC may also rerun the Acadia Black Edition. For ’19 it was available on SLT model and included 20-inch machined aluminum wheels with black accents, a black grille insert and black surround, black headlamp and taillamp details, and black mirror caps and roof rails. Expect the 2020 Acadia to retain the same simple but functional interior of the 2017-2019 version. The controls should remain well laid out, and all grades should return with a variant of GMC’s excellent IntelliLink infotainment system. Materials quality should remain near the top of the competitive set, particularly in the Denali. Passenger comfort should again be adequate in the first two seating rows. The third row — a highlight of the pre-downsized Acadia — is a kid-size afterthought and harder to access than in most larger rivals. In-cabin storage should be fine, but max cargo volume won’t change so you’re advised to see if the below-average capacity suits your needs. Almost certainly. General Motors shares elements of Arcadia’s underskin engineering with the five-passenger Cadillac XT5 crossover and the resurrected 2019 Chevrolet Blazer crossover. Stretched for a longer wheelbase and more generous third-row seating, the engineering also underpins the nearly full-size-class Chevrolet Traverse and upscale Buick Enclave crossovers and will reportedly be used for a Cadillac variant due for model-year 2020, called the XT6. Of the models currently in production, each excels for quietness, ride quality, and drivetrain refinement. Expect no different from the 2020 Acadia. Likely returning as standard will be Acadia’s base 2.5-liter four-cylinder engine with 193 horsepower and 188 pound-feet of torque. It should again team with a 6-speed automatic transmission. This engine provides adequate acceleration with the driver and one passenger aboard but is overmatched when loaded with a full complement of people and/or cargo. Likely returning as an option for all but the SL and standard on the Denali and All-Terrain variants is GM’s respected 3.6-liter V-6 with 310 horsepower and 271 pound-feet of torque. For 2020, expect a 9-speed automatic transmission to replace the current 6-speed. Those extra gears should allow the engine to stay in its power band longer, resulting in smooth acceleration, improved passing and merging response, and increased fuel-economy ratings. Finally, GMC may well make the 2020 Acacia available with the 2.0-liter turbocharged four-cylinder engine that made its debut in the 2018 Chevy Traverse RS. That engine makes 255 horsepower and 295 pound-feet of torque and uses a 9-speed automatic. A Traverse so equipped is surprisingly peppy. The Acadia would feel even faster because it’s about 300 pounds lighter. Don’t expect changes to the available AWD system, meaning mainstream Acadias and Denalis won’t be suited to serious off-roading. GMC does give the Acadia All Terrain some crud cred with an AWD system fortified with its Active Twin Clutch to optimize traction, plus a specific All Terrain mode in place of the Off Road mode on the drive mode selector to enhanced hill-climb capability. Probably not for the 2.5-liter four-cylinder. Expect Acadias with it to again have EPA ratings of 21/26/23 mpg city/highway/combined with front-wheel drive and 21/25/22 with AWD. Addition of a 9-speed automatic transmission should see models with the V-6 improve EPA rating to about 19/26/22 mpg with front drive and 18/26/21 with AWD. That would be a 1 mpg improvement across the board over the 6-speed gearbox. Should GMC add the turbo four-cylinder, expect ratings in the neighborhood of 22/28/24 with front drive and 21/27/23 with AWD. All engines would use regular-grade 87-octane gasoline. Acadia will continue with a laudable array of standard and optional equipment, so we don’t expect new features per se. We do urge GMC to expand existing safety technology, making the aforementioned driver-assistance features available, if not outright standard, on more than just the top two trim levels. Otherwise, Acadia’s standard and optional equipment for 2020 should largely mirror that of the 2019 edition. All grades should continue with standard three-zone automatic climate control, IntelliLink infotainment with Apple CarPlay and Google Android Auto, and built-in Wi-Fi hotspot capability with data service provided through GM’s OnStar telematics. The SL is chiefly a rental-fleet special, so most retail shoppers will again start their search with the SLE-1 grade, which would include LED daytime running lights and satellite radio. Expect the bulk of sales to come from the SLE-2 and SLT-1 trim levels. The former would add heated front seats, height-adjustable power liftgate, and remote engine start. The latter would include leather upholstery, larger infotainment system screen, blind-spot and rear cross-traffic alert, and rear-obstacle detection. Jumping to the SLT-2 would net the aforementioned driver aids, driver-seat memory positioning, front-obstacle detection, and heated outboard second-row seats. At the top of the pile would again be the Denali, with its specific exterior and interior trim, hands-free power liftgate, ventilated front seats, and a heated power tilt and telescopic steering wheel. Expect them to increase because of year-over-year inflation but also in response to what, if any, extra equipment GMC might add to lower trim levels. Still, even though GMC’s marketing department aims to position Acadia as a near-luxury crossover – particularly the Denali – its pricing should remain competitive with mainstream rivals. Base-price estimates are for front-wheel-drive models and include GMC’s destination fee, which was $995 for the 2019 Acadia. Figure on AWD adding an extra $2,000-$2,400 to the SLE, SLT, and Denali. Estimated base price is around $31,000 for the 2020 Acadia SL, $34,000 for the SLE-1, and $37,000 for the SLE-2. Estimated starting price for the SLT-1 is about $40,000, for the SLT-2 about $44,000, and for the Denali around $47,500. All Terrain versions should start around $42,000. Assuming GMC makes no other changes to the Acadia’s feature set, our pick for best value would be an AWD SLT-2 with optional imbedded navigation and wireless smartphone charging, which we expect to carry a retail price of about $46,500. A loaded AWD Denali, which will likely have a sticker price of about $50,000, would make for an interesting alternative to other flagship seven-seat crossovers, including the Ford Explorer Platinum, Honda Pilot Elite, Mazda CX-9 Signature, Toyota Highlander Limited Platinum, and Volkswagen Atlas SEL Premium. 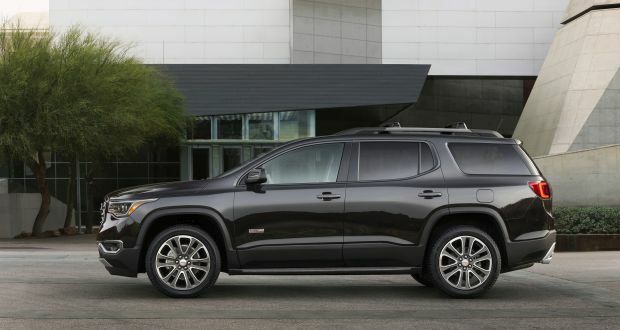 Release date for the 2020 GMC Acadia is expected in the fall of 2019.